Everyone has heard of Moet & Chandon, it’s like the Hoover (or maybe Dyson) of Champagnes, it’s a Champagne brand that has secretly spent years working its way into your brain, firing the celebration and luxury synapses as it goes. You’ll have seen it carefully product-placed in films, sponsoring events, and being sprayed by glamorous, successful, good looking racing drivers, so when you’re confused and panicking about what to buy in a celebratory emergency you’ll head straight for the Moet. The first time you drink or buy Moet & Chandon you’ll likely call it “Mow – ett” and someone will tell you you’re saying it all wrong. They’ll adopt a tone that is at once both condescending and French-accented and say “It’s French, you say “Mow – ay””. They are, as is often the case with people correcting others in public social situations, quite wrong. It is “Mow-ett” as the name is Dutch, even if the wine is all French. 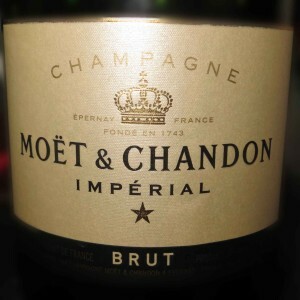 Although Moet and Chandon is one of the most recognised brands in the world, and the product is available in all manner of retailers, bars and restaurants, it’s not a cheap drink. Nor is it a factory produced one. Making Champagne is tricky. Making good Champagne is hard. Making good Champagne year after year to a recognisable taste profile out of a core ingredient that is different every year depending on weather conditions is very hard indeed, but it’s some thing that the big Champagne houses around Epernay have worked out. They blend hundreds of mini-batches of wines made from Chardonnay, Pinot Noir and and Pinot Meunier from across a few years to get the characteristic taste associated with their brand. For the Moet & Chandon Brut NV (Brut means dry, NV means non-vintage, letting you know that the wine in the bottle isn’t just from one year’s harvest, but a blend) that characteristic taste is light and refreshing, crisp with citrus and fresh bread flavours. The bubbles are tiny and keep on fizzing. It’s nice for celebrations, but it’s better for times when you can relax and enjoy it before a meal when your taste buds are unsullied. Expect to pay 2-3 times as much as you might for a supermarket brand Champagne. The average is about £34 at the moment, although if you want more than one bottle Majestic has a special offer where if you buy two or more you get them for under £30, which is a great price.